Baba Ganoush Recipe (Roasted Eggplant Dip) | Simple. Tasty. Good. 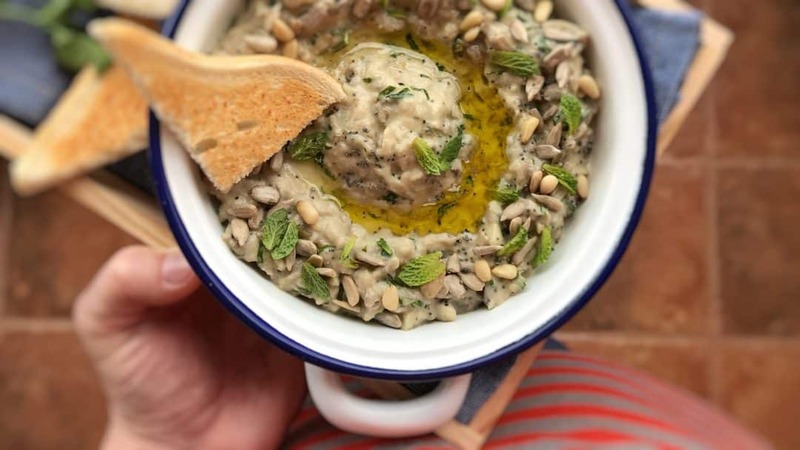 Have you ever heard of baba ganoush before? Sounds quite exotic to me! Maybe you have your very own baba ganoush recipe at home? This healthy roasted eggplant and yogurt dip is part of the famous Mediterranean mezze family. Baba ganoush, tzatziki, hummus, fava bean dip, rahib salad… they all go extremely well together! Whenever I fancy a little light mezze dinner at home these delicious mezze dipping sauces are definitely on top of my list. And you can easily make every single one of them freshly at home of course! Those are all very simple recipes and all very easy to prepare in advance. 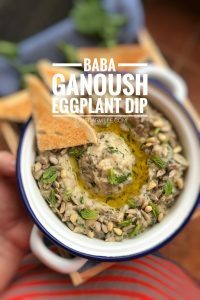 This is my own little version of the classic roasted eggplant dip also known as baba ganoush recipe below. Well I’m sure there’s about a million other ways and recipes out there. No big deal, as long as it tastes good – that’s the main thing. One crucial ingredient however that really makes a difference is the sesame oil. I very often use sesame oil as a substitute for tehina or sesame paste, an ingredient that is a bit hard to find here. And the sesame oil works just fine! I sprinkled some pine nuts, sunflower seeds and fresh mint leaves on top for garnish right before serving. This baba ganoush dip looks pretty darn good. I made this baba ganoush recipe twice: once using a blender and the second time I prepared this roasted eggplant dip in my fabulous KitchenAid Stand Mixer Mini! For that one: scroll down to the second recipe below and watch my recipe video of how I’m preparing baba ganoush, a healthy roasted eggplant and yogurt dip in my fabulous KitchenAid Stand Mixer Mini! 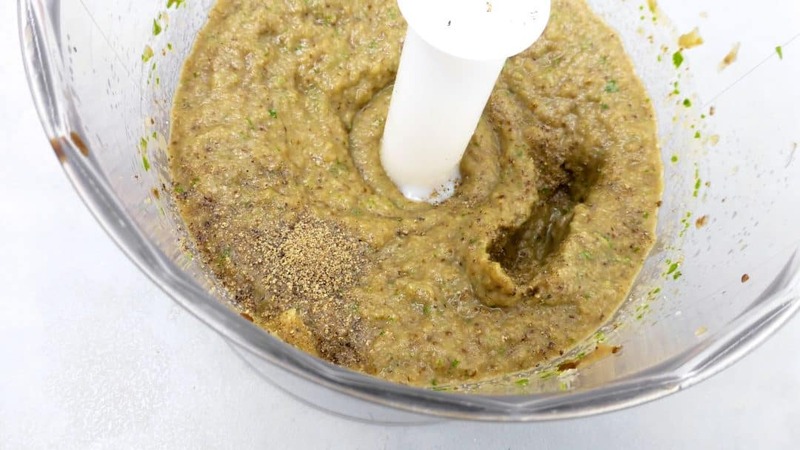 What if you don’t have a blender or stand mixer? You can still prepare this roasted eggplant and yogurt dip, no worries! Just chop up the soft eggplant meat very finely. Add it to a mixing bowl of a deep plate together with the other ingredients. Season to taste and mash it all up using a simple fork until you get the consistency that you are looking for. Easy! An extra tip that I want you to know: this eggplant dip tastes better when the eggplant is freshly roasted and still a little lukewarm. It mixes better with the oils and the yogurt and makes it much creamier! If you roasted the eggplant a day or so in advance, just place it in the microwave for about a minute. It helps! You can add extra yogurt if you want it to be less darker in color. Pierce the eggplant several times with a knife. Wrap it in tinfoil and put it on an oven rack. Roast the eggplant in a preheated oven at 428°F (220°C) for about 45 minutes. Then turn off the heat. Leave the eggplant in the oven for another 30 minutes. Then cut it in half and let it cool. 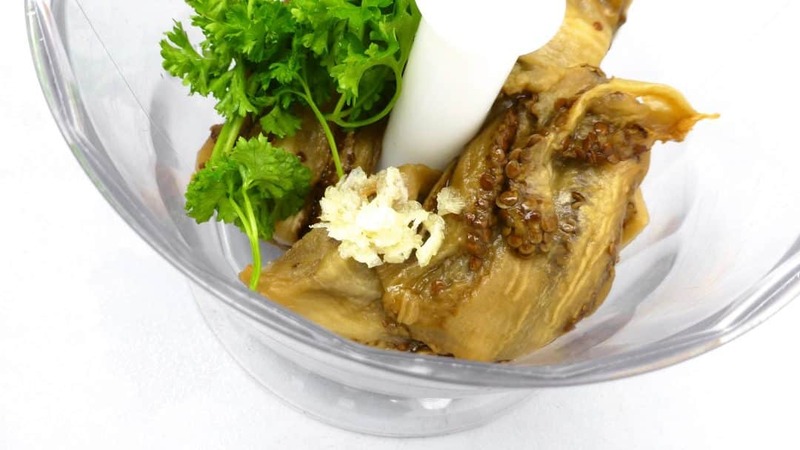 Remove the soft eggplant meat with a spoon. Discard the tougher skins. Then transfer the soft eggplant to a blender. Also add the mashed garlic, parsley and half of the chopped cilantro. Blend the ingredients. Add the yogurt. Blend again. Then add the lemon juice, olive oil and half of the sesame oil. Season with pepper and salt to taste. Blend the eggplant dip again until it's creamy and fragrant. Add extra yogurt if you want it to be less darker in color. Then check the seasoning and add extra pepper, salt, sesame oil or lemon juice to taste. Transfer the roasted eggplant dip to a deep plate or bowl. Put it in the fridge for another 5 minutes. Sprinkle lightly with some olive oil oil, the remaining chopped mint and pine nuts or sunflower seeds. Serve the baba ganoush cold. That’s it for the blender version of my delicious eggplant baba ganoush recipe! 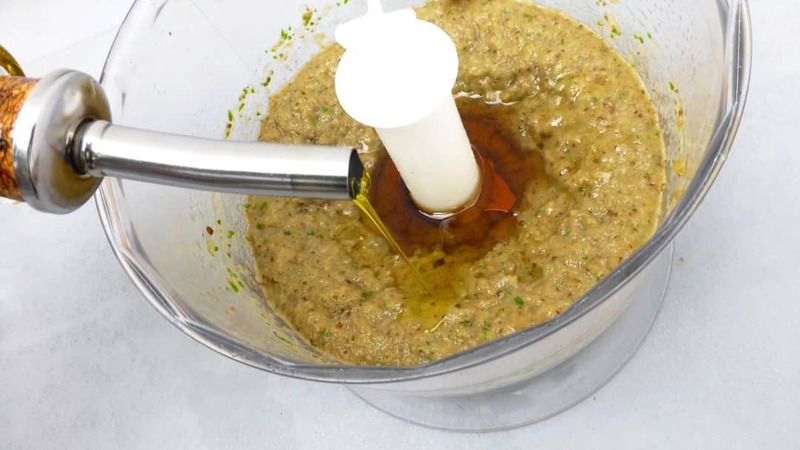 So here’s how to make this eggplant dip using a stand mixer! It’s chunkier than the blender version of course but I prefer the chunky one! Make sure to chop the eggplant finely though. 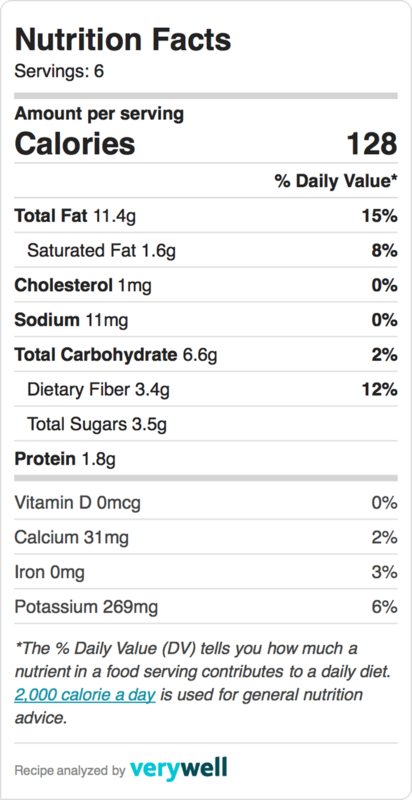 Add extra yogurt if you want this eggplant dip to be less darker in color or less yogurt if you want the eggplant dip to be darker. Here’s my classic baba ganoush recipe: a roasted eggplant dip with yogurt! 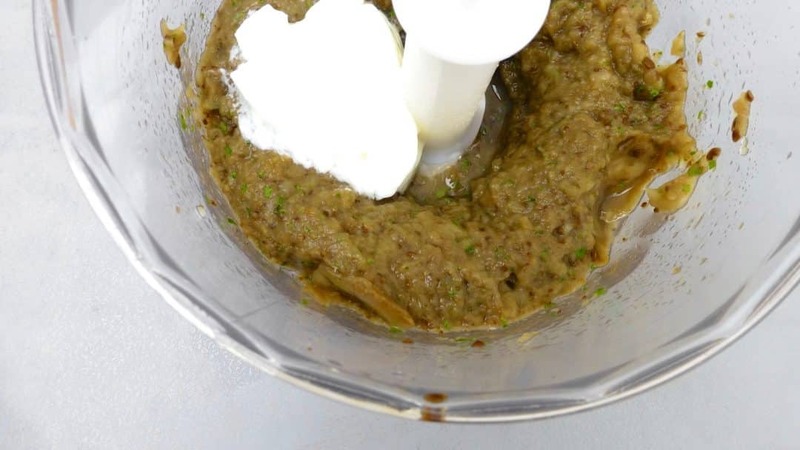 Watch my video of how to prepare baba ganoush with the KitchenAid Stand Mixer Mini! Enjoy! Then transfer the eggplant meat and the remaining ingredients to the bowl of the KitchenAid Stand Mixer. Season with a pinch of pepper, salt and garlic powder. Attach the wire whip and lower the mixer head. Set speed 2 for 2 minutes. After that, set speed 4 for 2 minutes. Set speed 6 for 10 minutes. In the end the eggplant dip should be creamy but still a little chunky. Add extra yogurt if you want it to be less darker in color. Check the seasoning and add extra pepper, salt, sesame oil or lemon juice to taste. Transfer the roasted eggplant dip to a deep plate or bowl. Put it in the fridge for another 5 minutes. Sprinkle lightly with some olive oil, extra chopped mint and pine nuts or sunflower seeds. Serve the baba ganoush cold. While I was writing and building this baba ganoush recipe post, I was also browsing through my extensive food photo library and found quite a bunch of eggplant recipes or recipes with eggplant in it. One is quite similar to this roasted eggplant dip because the ingredients list is more or less the same. So is the taste: my Indian style baked eggplants in yogurt sauce! So if you adore the eggplant dip above, then sure take a look at this one too. You won’t be disappointed! Escalivada is a Spanish roasted vegetable dish that contains roasted bell pepper, onion and eggplant. Escalivada is served cold as a salad and often topped with salted anchovy fillets and black olives. A highly delicious roasted vegetable dish! I love it as a light lunch or as a side dish for grilled fish or pork. Definitely worth trying out. Let’s move on to yet another eggplant recipe this time, one with a bunch of beautiful Eastern flavours as well: my eggplant curry with hard-boiled quail eggs! Oh you will just love this one. Imagine flavors such as fresh ginger, smoked paprika, cumin, nutmeg, garam masala curcuma and fresh herbs such as cilantro and mint. That just can’t go wrong. OK great. What other recipe can I find in my large recipe collection that has eggplants in it? Let me see. Steamed eggplants Chinese style! This one here is one of my most popular recipes on my website. I used to have a steamer oven but since I moved to Spain I had to find another way to steam eggplants. It’s very easy to make a steamer at home though! If you have a pasta pan with those holes in, that’s what you need to make a steamer at home. Just pour an inch (2,5 cm) of water in a large pan and place the pasta pan in it as well. Add the sliced eggplant to the pasta pan and cover with a lid. Bring the water to a gentle boil over medium heat and let the eggplant steam until soft. Peanuts! 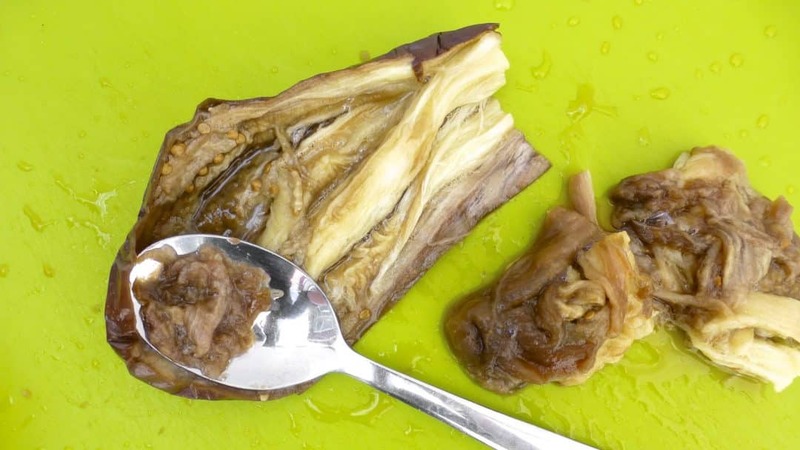 Next up: three European eggplant dishes that you have definitely heard of! First one is a classic Italian dish, and my favourite Italian comfort food as well: eggplant parmigiana! Super smooth layers of eggplant drenched in tomato sauce and hiding under a layer of parmesan cheese. Gosh I should make this super delicious eggplant parmigiana again soon, it’s been a while! A Spanish eggplant classic, one that will ring a bell: stuffed eggplants! Half eggplants hollowed out and stuffed with a delicious beef mince and tomato mixture. Topped with grated cheese… This classic is well known under the name of berenjenas rellenas – stuffed eggplants in Spanish. Do try that one out! These stuffed eggplants are easy to make in advance. Just pop them in the oven, great lunch. The third classic eggplant recipe I wanted to talk about is Greek and that should ring a bell. Greek. Eggplant. Easy one! Moussaka of course. Layers of fried potatoes, eggplant and meat mince. A layer of béchamel sauce and some grated cheese on top. And again a great dish to make a day in advance! I love eggplants in combination with spaghetti as well. Here are two pasta recipes with eggplant in it. First off a ratatouille pasta sauce with capers. Chunky and colorful! I made that one using my KitchenAid Shredder and Slicer. My second pasta recipe is kind of similar: slices of roasted eggplant and bell pepper with spaghetti, garlic and olive oil. Super light and delicious mediterranean dinner ideas!